Everybody likes a good great white shark story, as evidenced by the number of Internet searches for the terms "world-record great white shark" and "great white shark." So for your great white shark enjoyment, here's a story that doesn't quite have the intimidation factor of a Jaws-type encounter but does feature a photo (above) that begs the question, "What if that thing had been swimming around where I had been in the water?" There isn't much drama here; it's more about the size of the dead shark. According to the Pisces Fleet Sportfishing Blog, this great white shark was caught a couple weeks ago in the fishing net of two commercial fishermen off the coast of Sonora, Mexico. 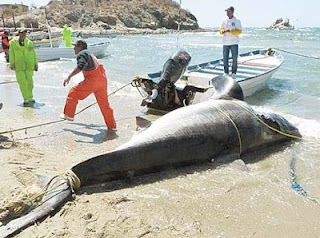 They couldn't get the dead shark into their 22-foot skiff so they towed it to shore. There, about 50 people helped drag the shark up onto the sand. The great white shark measured 20-feet long and was an estimated 2,000 pounds, though we believe it could have been much heavier. Why? Because of the story of the world-record great white shark being captured alive by the National Geographic Channel's "Shark Men." 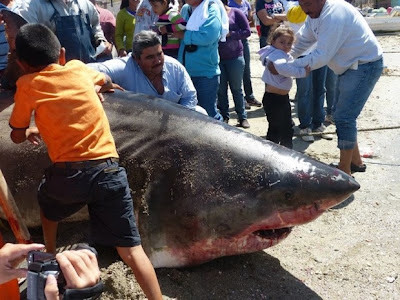 That shark was 17 feet, 9 inches and weighed an incredible 4,225 pounds. You can see the video here. That shark was let go, allowing it to be free to continue intimidating divers, surfers, swimmers and sea lions. The shark above? According to the Pisces Fleet Sportfishing Blog, "not one scrap went to waste; it fed the whole town." BTW: The IGFA world-record great white shark caught by rod and reel was 2,664 pounds, taken off South Australia in 1959, when it wasn't illegal to catch great white sharks.